Andreas is actually better known in the CPC demoscene under the name of Face Hugger (in reference to Alien movie). He has been very productive in the beginning of 90s and has demonstrated realtime 3D usage was definitively possible in Amstrad CPC productions - his most successful production at the time being the Ultimate Megademo. I was personally curious to know more from Andreas now the Amstrad CPC is considered as dead - well, sort of..
1. Hi Andreas. Please can you quickly present yourself ? What are you doing now for a living, and how old were you at the time you were an active programmer for the Amstrad CPC ? Hi, Arnaud. As far as I remember, I made my first programming experience in 1987, starting with BASIC on my CPC6128. At that time I was 17 years old. Due to my older brother Joachim, who was studying computer science and was already a superb programmer on his Apple II, I learned a lot more about programming smart things in BASIC. After Joachim has sent a program to a german CPC magazine (CPC Amstrad International) that was published, I started to do the same and successfully published some programs until 1992. Today I'm married, I have two little Kids and I'm still in the programming business, working as an embedded software developer. 2. When "Ultimate Megademo" got released (in 1992 if I'm not mistaken), every other demo-groups were fighting with even more scrollers at the same time on screen. How did you get 3D programming knowledge at the time ? (hint : Internet was not there at the time). Was there people considering your production not as a demo at all because it was not making usage of advanced CRTC techniques ? At that time I had an Amiga 500 with lots of cool demo stuff. One of the most impressive Amiga demo at that time was the Red Sector Megademo. I think the Red Sector Megademo contained a text explaining how the 3D calculations of the vector balls have been done. This was my start to try the same on CPC. At that point, and after GWM (CPC guy) has introduced me to the german CPC scene and after GWM motivated me to make a demo, I decided to make a megademo. I have programmed the first demo part and put that part to disc. Then I started to think about the next part and put that part to disc. I continued to do so until the disc was filled up, so the whole demo was born part by part over a time span of more than a year without a global concept. Some people complaint about the missing concept or style, but I think everybody accepted this as a demo. 3. 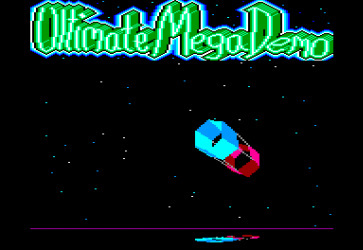 Still about "Ultimate Megademo", all the musics were created/converted by you. Did you develop at the time a custom (and unreleased) tracker ? They were really great btw. Yes, the music has been done with my own tracker called Sound Manager. It was one of my early CPC magazine publications, nearly completely written in BASIC. For the megademo I made a new player-routine (because the original player routine was also written in BASIC). 4. Your whole work was much more than putting 3D on the table. What impressed me at the time - and still is actually - was using Amiga for creating graphics (fonts, backgrounds, etc). Can you tell us more about the pipeline you used, and the custom tools you had to develop for ? Is there something else that was clearly new at the time but not as a visible part ? I loved to use DPaint on Amiga for painting my graphics, DPaint was so powerful! I already used the correct color palette in DPaint, then I transfered the picture to a DOS disc. Then I used my program DosCopy on CPC to copy it to a CPC disc. After that I used my tool IffCon to convert the graphics from Amiga IFF format to CPC format. To bring the Amiga graphics to my CPC screen is the reason why these two tools has been written. IffCon was also able to convert Amiga graphics not matching the CPC palette with good results using dithering technics. 5. Was your participation in "Voyage 93" your very last Amstrad CPC demo ? How was your relationship with other talented German programmers such as Prodatron, Alien.. ? Do you still have contact/fun with them ? I think my last demo for the CPC was the MOPS Megademo released in 1994 and done by all members of our MOPS team (MOving PixelS). I always had a good relationship to other CPC guys. From time to time I still meet some of these guys. 6. Did you quit Amstrad CPC because of Doom game ? (like many others like me at the time :) Or because of the Amiga ?.. The Amiga was always the secondary machine mainly used to play games. I quit on CPC because I bought an Acorn RISC PC in 1994. A fantastic machine with a 30 MHZ ARM CPU, fast as hell and a with a great GUI. I wrote a CPC emulator for that machine. Later I wrote a Gameboy emulator (reusing my Z80 emulation) and an SNES emulator. The Acorn RISC PC was upgraded to 240MHz at that time. Unfortunately the SNES emulator never got finished due to my lack of time. 7. Do you still have interest from times to times in discovering new Amstrad CPC releases ? If yes, what do you think of them ? Are they great successors to you ? Did you watch the just released Batman Forever ? What do you think about it ? Are you impressed, to you is that the best CPC demo ever done? Yes of course! I'm still interested to watch new CPC demos! It's unbelievable, that there are still guys programming stuff for CPC! I like the idea to cross-develop for CPC. Using the MAXAM assembler on CPC is stoneage in comparison with the cross-developement possibilities you have nowadays. It is quite difficult to judge about demos to determine which is the best because each demo is somehow unique. I have seen the Batman Forever demo and I was absolutely impressed! It is conceptional and technical perfect! As mentioned during the interview, Andreas used a custom tool to create the musics for his megademo. 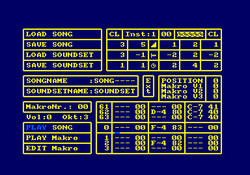 It has been programmed entirely using BASIC programming language (even the song player ! ), with a very small portion of assembly code used for displaying. Andreas kindly accepted to get it diffused through this website ; its aim is for historical purposes only - as a consequence the author or this website will not provide any kind of support around it, so please do not start making your own compositions using the tracker. Usage : Download the .DSK file below. You must use a joystick or use the AMX mouse emulation in WinApe emulator in order to move the little arrow of the sound manager. The disc image includes the original files that have been published. To load the single demo song, you have to click on the song name field and enter the name SONG and press Return key. Then you have to enter the soundset name SOUNDSET in the same manner. Then you have to click on LOAD SONG and after that on PLAY SONG. F5 should stop playing the song.